India today executed Mohammed Ajmal Mohammed Amir Kasab, the lone survivor of the 10-member Lashkar-e-Tayyiba terrorist squad that killed more than 160 people of various nationalities in Mumbai on 26 November 2008. The other nine terrorists were killed during the encounter with India’s security forces. Kasab, a Pakistani national, was hanged to death at 7:30 am local time at Pune’s Yerwada jail on Wednesday, 21 October, five days before the fourth anniversary of the bloody attack. He was buried in the premises of the prison where he was hanged. Keeping in mind the sensitivity of the matter, the Indian government chose to keep the whole thing a secret. 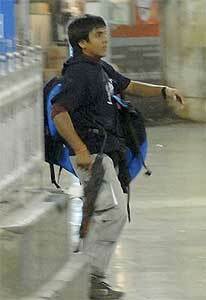 Kasab was sentenced to death by a special court in May 2010. The verdict was upheld by the Bombay High Court and Kasab’s subsequent appeal in the Supreme Court was turned down. Two weeks ago, his mercy petition to the President of India was also rejected, which set in motion the process for executing the death sentence. “The petition for clemency filed by condemned prisoner Mohammed Ajmal Mohammed Amir Kasab was rejected by the President on 5th November, 2012. The sentence was executed today at 7.30 a.m. at Yeravada Central Prison, Pune,” said a crisp press release from the home ministry. “All the police officers and personnel who lost their life in the battle against the terrorists have today been served justice,” said India’s home minister Sushil Kumar Shinde. He added that India had informed in advance Pakistan and the family members of Kasab about the decision to hang him, but Islamabad refused to acknowledge the letter. “The External Affairs Ministry through our mission in Islamabad had informed the Pakistan government about Kasab’s hanging. When they did not accept the letter, they were communicated through fax,” Shinde told reporters in New Delhi, hours after the hanging. Union said family members of Kasab, who live in Pakistan, had also been informed by Indian High Commission in Islamabad. Home Secretary R.K. Singh said that Kasab’s family members, who live in Pakistan, were communicated through courier by the Indian High Commission in Pakistan. “We have the receipt of the courier sent,” said Singh. Kasab’s hanging was welcomed by the victims’ families.